Beth and I had a grand time at the Big Flea this weekend. Last night I wrote and posted some pictures that we took while shopping. Just scroll down to yesterday’s entry to see the fun! As promised here are some pictures of the great stuff that I got. 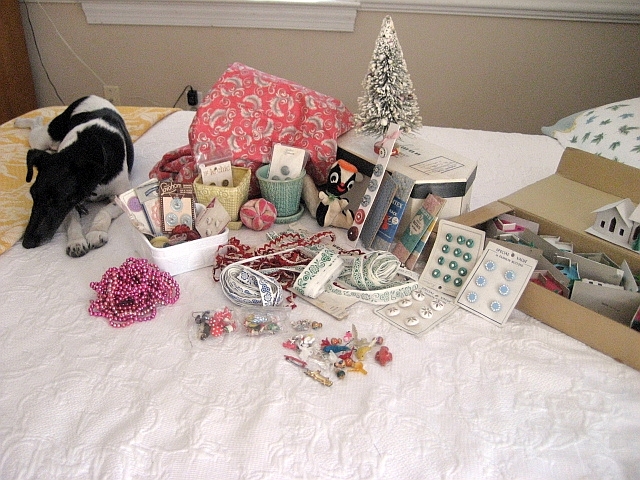 We scored big time on vintage buttons! 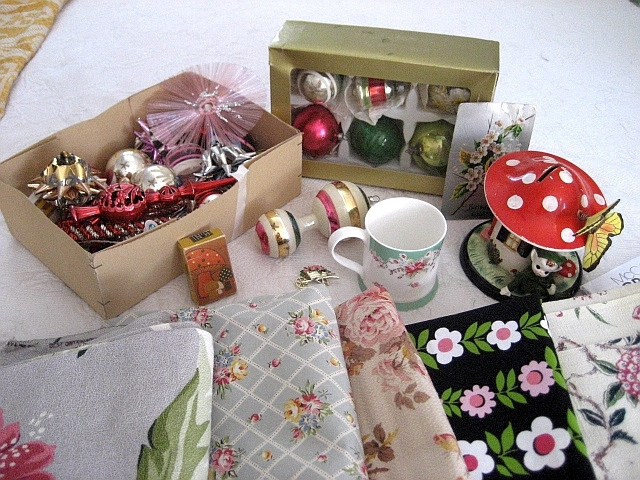 I got some lovely vintage planters, a whole village of vintage putz christmas houses, an old bottle brush tree, vintage rick rack, some jewelry and assorted little things. The fox terrier is old stock, I already had her at home! Most of these items will end up in creations for eBay or Etsy. 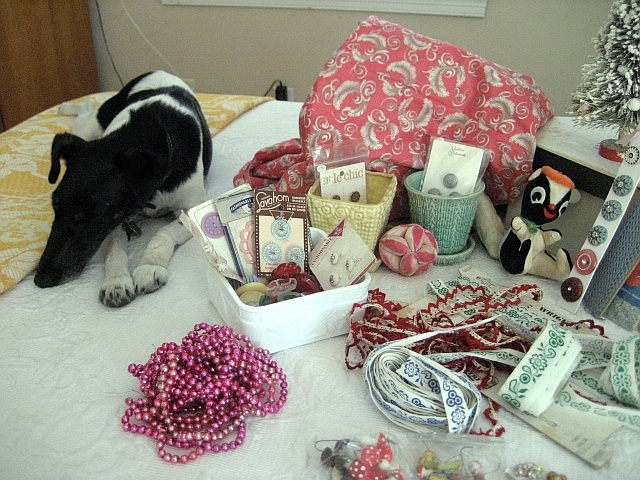 We were very good this time at the Big Flea. We only purchased one piece of fabric that we split between us. Goodness knows I don’t need any more fabric! If you have seen the pictures of my fabric stash you will understand me! Whenever Beth and I get together we always bring presents to each other. As we are out and about in our respective cities thrifting, yard saling, estate shopping we not only shop for ourselves but we shop for each other. I brought to BFF this trip some awesome figurines that I had picked up in my travels and they will be showing up on her fabulous pin cushion creations soon. This trip BFF had a huge box full of goodies for me. Take a look at all this great stuff! Do you see all that fabric! Now WHERE am I going to put that! 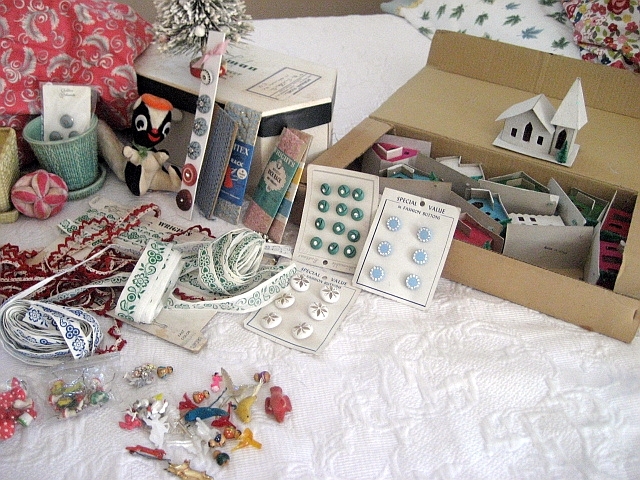 Beth knows that I am a rabid collector of all things vintage christmas and she found some wonderful ornaments for me. And the big mushroom bank, LOVE IT! Now I’m sure you all know the talented and lovely Jen Duncan. Jen is such a sweet person and her artful life is truly an inspiration to me. Well, just out of the blue a package arrived on my doorstep last week from Jen and inside were these lovelies. 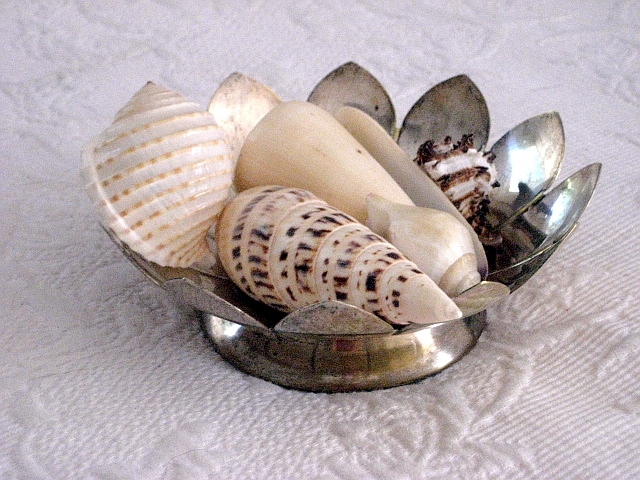 After reading my recent post about my collections of seashells and vintage silverplate, Jen sent me this surprise package. Love, love, love it! Thanks Jen, you’re a sweetie! Lastly, I recently discovered a wonderful artist on Flickr. She is from the pacific northwest and she makes the most amazing handbags. I just had to have one. I contacted her through flickr and she let me pick one out for purchase. 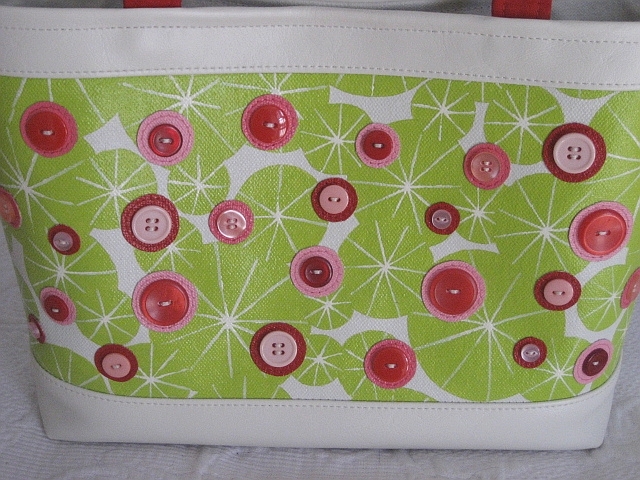 I just love this nasturtium design with the buttons, it is fabulous! 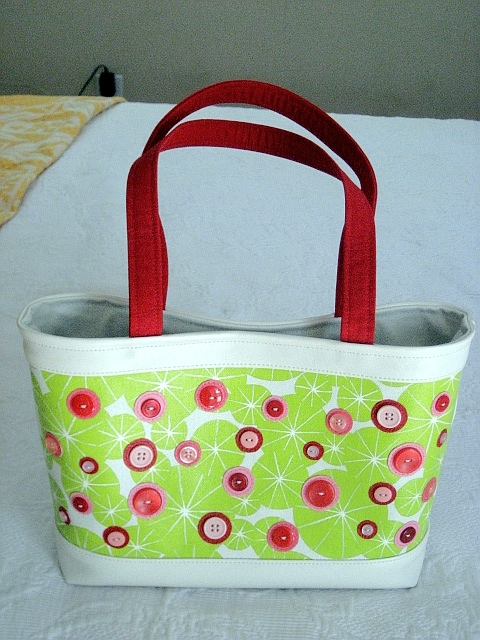 Now, even though I design and sew purses and totes, I love to purchase them from other artists. Check out her other designs here on her flickr page. So original! I will be toting this lovely around when I go on my second honeymoon in August. Thanks Chanda! Oh my!!! You two completely lucked out!!!!!! What great finds!!! I LOVE vintage Christmad decorations too! You scored big time!!! I am not surprised…you have managed to find some really terrific things. I’m sure that some of those things are going to turn into even more beautiful and interesting works of art. The bag is a really fab find…I may have to get me one of those! I wish I’d gone to that now! Beautiful finds and a great blog! I’m linking to you now. um, could you gals use another friend?? you sure are swell gift givers 😉 tee hee. Really enjoy reading about your treasures and finds. Would you let me know how to contact Chanda? I visited her Flikr photos…love her bags! But I couldn’t figure out how to contact her. I love those little putz Christmas houses…when I was remembering them a couple years ago from my childhood I searched on eBay & was surprised how pricey they were…I guess a lot of people had fond memories of them from childhood. My family had a fox terrier, though I don’t remember her. I think she died when I was a baby. Momma always talked about her to me — she would sit up to the piano and *play* and *sing*, and they had taught her to do many tricks. I think Momma was very, very fond of her! Yours is very cute, and I can tell fox terriers are a lot of fun, and very endearing!